Get this season's hottest look with a plus size midi dress from our latest collection. In a range of casual, smart and evening designs, choose from flattering skater dresses, figure-skimming swing shapes and on-trend wrap styles. Whether you're shopping for everyday wear or you're going-out-out, find your perfect look in sizes 14 to 34. Whatever the occasion, midi dresses are a must this season. 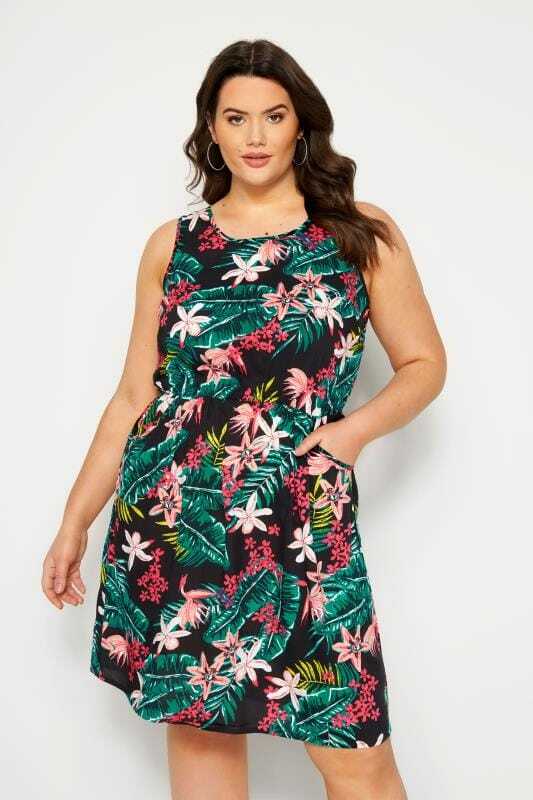 Designed to sit just below the knee, our plus size mid length dresses come in a variety of styles, from relaxed fabrics and loose designs to more fitted options. Whether you are looking for casual, evening or work wear clothing, find your perfect look in US sizes 14 to 34. Create a chic 9-5 look with one of our plus size midi dresses with sleeves. Ideal for providing extra coverage to your arms, our range features fashion forward options such as angel sleeves, full length and ¾ length sleeves. From printed styles to simple and stylish understated options that are easy to accessorise, simply team with a blazer and a pair of your favorite courts to complete the look.